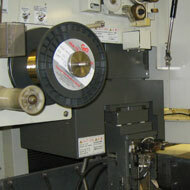 Veridiam’s Swiss-Style Turning center has produced ultra-precision machined components since 1962. Veridiam was a pioneer in helping to design, develop and manufacture dental implant platforms, abutments, drills and dental implant instruments. Veridiam plays a large role in manufacturing orthopedic bones screws and plates supplying some of the world are leading Orthopedic Companies. We are dedicated to providing customer service and products that go beyond satisfaction. Engineering excellence, high quality and precision manufacturing is our passion. Our highly skilled and experienced personnel routinely develop innovative solutions for your most demanding product needs. Veridiam is a Six-Sigma Organization fully committed to continuous improvements. Our mission is your success!